Erin was fortunate enough to attend Law Day in Kenosha on May 1 and then Law Day in Madison on May 8–he wrote an essay on Rules of Evidence and was one of 28 kids chosen from all 7th graders in Kenosha County for the Madison trip. Thanks to our Representative, Samantha Kerkman–we have a picture of the group. Thanks Samantha! State Capitol, Madison, WI . . . Kenosha County Law Day was celebrated in Madison on Thursday, May 8, 2008. Selected students from Kenosha County area school districts were chosen based on essays they wrote on this year’s theme: Rules of Evidence. Students were to compose an essay explaining what the theme meant to them. Earlier in the week on American Legion Law Day, CSI Officer Todd Thorne gave a presentation to area students on the importance of evidence gathering at crime scenes with respect to our criminal justice system. 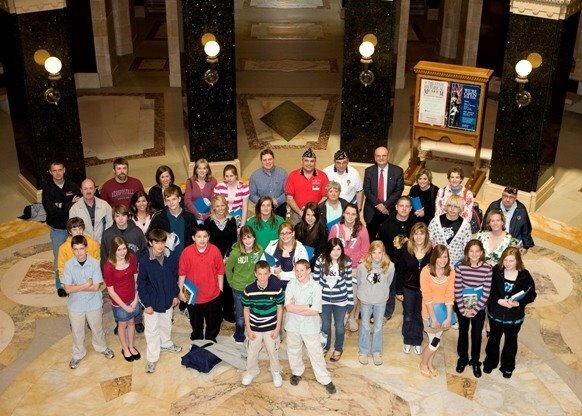 Based on their essays, twenty-eight students were selected to travel to Madison and learn about government at the state level. Representative Samantha Kerkman (R-Randall) gave a guided tour to students, teachers, and members of the Kenosha County American Legion. Cole Andrekus, a student at Bristol Grade School, was selected as this year’s winning essayist. He is the son of Mark and Debra Andrekus. Cole was presented with a plaque in Madison. Isn’t that neat, Karen? Did Erin enjoy it?